In the era of “sustainable competitive advantage”, strategic change used to be a well-managed cascading process. Today, organizations are faced with the need for continuous, faster-paced, and more disruptive changes, to the degree that change management in itself becomes a key factor in keeping ahead of competition. Few management teams are prepared for this era. Corporate management team structures remain archaic, and are still in the process of adapting to the new competition mode. In a world of continuous change, mixing technology, and information overflow, leaders need new skills and ability to manage scope that traditional management team roles may not cover. A professional leader of change itself is needed. We introduce the role of Chief Transformation Officer, in the context of a 3C framework. “Continuity” in large scale transformations; “Consistency” in aligning all operating model elements to the target state, and “Control” of the journey by implementing proactive risk management, deciding on interventions and engaging in people management. This article was originally published in 2013, but the topic becomes more and more important. We therefore decided to refresh the content, adding both new insights and recent trends that influence the role of the Chief Transformation Officer. As the pace of change accelerates in technology, customer demands, markets, competitive landscape and global trade, managing what has become practically a continuous transformation of the corporate is now a core skill and function. This article seeks to present the considerations for such a role, the skills underpinning it, and what it means for the composition of the management team. Advanced affordable technologies combined with rapid globalization have transformed virtually all industries over the past years. Whereas the digital revolution cannibalizes existing business models (as happening in media and retail industries, as well as consumer services like transportation and accommodation), it also opens growth opportunities for incumbents. For example, worldwide revenues for big data and business analytics are estimated to exceed 200BUSD by 2020 (IDC; note that in 2013 IDC estimated big data to be 32BUSD by 2017, but current estimates are 4-5 times that figure). The industrial IoT market is estimated to reach close to 270BUSD by 2020 already. In the tech space “unicorns” appear at ever-increasing speed (many also disappearing equally fast) as digital business models lower the entry barrier into many industries, enabling startups to enter with innovative and scalable business models. Both new and established companies face an increasing need for renewal and transformation. Managing rapid change presents completely new challenges for leaders, and it is an area where many fail – startup leaders included, as the recent case of Uber highlights. Incumbents feel the pressure to build new businesses, as their traditional offerings become commoditized (or are replaced) and face increased price erosion. For new entrants, controlling growth and maintaining momentum is the key challenge. Management teams of both incumbents and new entrants all face the challenges of keeping initiatives on track, assessing risk and intervening at the right points, while managing the human aspects of the change journey. In the past, strategy served as the means to capture a dominant position on the market, built on a “sustainable competitive advantage”. Implementation followed strategy formulation, and good execution drove the results home. The CEO led the journey, supported by an intelligent Chief Strategy Officer (CSO) and a reliable Chief Operating Officer (COO). However, the paradigm of sustainable competitive advantage is rapidly eroding across many industries. Competitive advantages evolve and are copied at an increasing pace, forcing companies to execute fast to capture the benefits when new opportunity arise. Even players with formidable advantage, such as Apple, Google and Facebook, must continuously push forward as new challengers emerge often from unexpected directions. For some the evolution has never stopped, as in the case of Amazon. The e-commerce giant started by selling books in the mid-1990s. In the late 1990s and early 2000s, its selection expanded beyond books and it built new competences in logistics and order fulfillment. Soon Amazon also launched Amazon Web Services to capture opportunities in cloud computing and hosting, which now generates almost 10% of the revenues. Since then, the company has expanded into consumer electronics, such as Kindle, ebooks, and streaming services. Recently Amazon decided to open physical stores and acquired Whole Foods, entering to yet another offering area. A new game has emerged for CEOs and their management team. Leading is no longer merely management of a portfolio of development initiatives, measured by financial metrics, while building and maintaining a specific competitive advantage. Change is a continuous element of the new leadership framework. We illustrate this in figure 1, which presents the 3 C’s of continuity, consistency and control, and how these play out in the traditional Plan-Do-Check-Act context. A transformation implies more than adjusting business models. Roles and required skills change, processes and systems are changed, interfaces moved or adjusted. Transformation is all about team work. The interplay between the management team and the Chief Transformation Officer plays a key role. If this team can collaborate rather than get tangled into turf wars, power games and politics, the transformation has a base for success. Achieving this is not always easy, since the leadership roles and skills required also change. What constituted a powerbase in the past may quickly vanish. Appointing and including the transformation officer already in the planning phase of a transformation can help, and bring perspective on the process. The Chief Transformation Officer is then also in a better position to act as a bridge between the strategic planning and decision-making, and to connect the change implementation phases. The involvement in both phases also mitigates the all-too-common pitfall of having a disconnect between a plan devised in the top echelons of a company, and the implementation done by mid-management. While a more static strategy typically constitutes of a collection of projects to transition from “A” to “B”, a dynamic transformation includes different horizons and visionary thinking about the direction the company is taking. The absence of a clear overall vision can result in overlapping and even contradicting projects. Therefore, a pre-requisite for a successful transformation is a shared vision bonding various initiatives and defining their importance, scope, and targeted impact. The vision also sets a base for a change story that is simple enough and catchy so that people understand and remember it. Consider the case of Xerox; an established company that faced a serious disruption. The company voiced its vision as “set the page free”, to turn the decline of its traditional ink-and-paper printing business into an opportunity. A more classical example would be NASA’s “send the man to the moon and safely back before end of the decade”, as willed by JFK in the 1960’s, which guided the space agency to radically ramp up their capabilities and ultimately, success. The Chief Transformation Officer can play a key role in helping the management team to define and articulate its change story, and to spread the message in a coherent and effective way. A preamble to any change journey is building market insight and foresight through internal and external sources. Collaboration with the front line, think tanks, universities and research agencies is crucial to building perspectives that instill confidence for the transformation, and make the necessary decisions. While in the past strategy development and required analysis may have been a task for executive teams and consultants, the more dynamic transformation call for a “massively participative” process to engage the whole organization. This also high-lights the “spider in the web” role of the Chief Transformation Officer, and how a key part of this role is to connect the various parts of the organization. Despite a clear shared vision and solid story, a change journey is often more cumbersome than expected. Timely interventions and adjustments (at times forceful) are required. Managing this and the associated uncertainty often justifies the appointment of a dedicated transformation officer. Leveraging this role in the process mitigates decision-making paralysis, which may arise due to unclear roles or lack of time of other management team members. Methodologies like “success gates” emphasize the active review of plans and progress along the way, and can support the steering process. If a milestone (success gate) is not reached, the entire plan should be thoroughly reviewed and directly addressed by the change responsible, rather than claiming “we can catch up if we just work harder”. 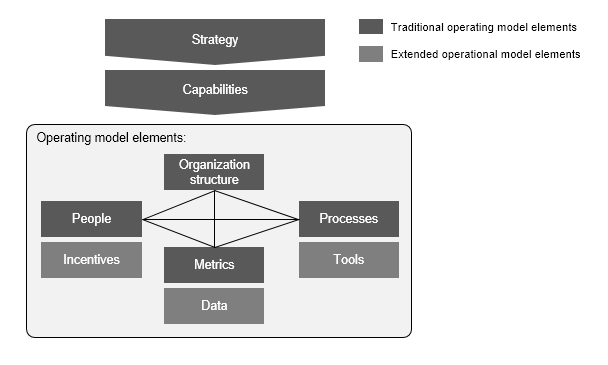 As the corporate proceeds through its change journey, executives need to retain real-time control over all of its various operative elements (figure 2). The Chief Transformation Officer can play a key role in ensuring the operating model elements align across the process, taking steps to re-engineer or fine tune parts when needed. This task implies both system related and people related actions, necessitating both an efficient PMO (program management office) function, and active human leadership and communication. The job of the PMO is not only to report on progress, it also entails designing, documenting, standardizing, re-engineering and disseminating best-practice processes. For fast-paced change, real-time prioritization becomes crucial, so that the PMO can be working synchronously with the C-suite to support decision making. The task of tracking and addressing both hard (financial) and softer (cultural) transformation-related metrics to steer the journey can certainly be challenging. To ensure efficiency of tracking, automation plays an extremely important role, as does flexibility. The amount of data to be collected can be large, often requiring real-time accuracy, and changes over time. Having a flexible and agile information collection system and architecture is valuable to standardize reporting tasks. The involvement of the Chief Information Officer (CIO) ensures that systems are designed with the transformation in mind, allowing, for example, open interfaces for data collection and exchange. Maintaining a holistic view on the human side of transformation is often overlooked. Failure in change is often caused by lack of focus on organizational inertia, misaligned incentives, and resulting office politics. Sensitivity to these issues, and ability to intervene promptly is part of the Chief Transformation Officer job. This also implies spending time in the front line and understanding how various staff members experience the journey. In the end, a transformation relies on people changing the way they work. Connecting this change to metrics and ensuring feedback loops to the PMO helps in steering. Fortunately, the Chief Transformation Officer is not alone, and here liaising and soliciting the help of the HR function is key. Another key element is communicating the progress back to the organization. Despite the availability of new tools and technologies, many corporations still rely on line organization as the main communications channel. Cascading the story in phases can make the job easier for middle managers. Audiences can be segmented in categories based on how much they are impacted and how important their personal renewal is for the whole transformation. Other communication channels like intranet, internal newsletters, discussion forums and formal/informal webinars (leveraging tools such as SharePoint, Yammer, Podio, #Slack, Skype and Adobe Connect) can be used to ensure a broader reach. Obviously leaders themselves must walk the talk, and do it consistently. Orchestrating all these activities requires a skilled change leader able to see the big picture, take decisions to adjust, and lead and coach both the corporate staff and various constituents. In the past, this was the task of the CEO and business unit heads. Increasingly, the job is so demanding and time consuming that these people cannot handle it. The Chief Transformation Officer can add considerable value here, both by bringing the required skill, the ability to focus fully on change, as well as by connecting all the parties. Beyond collecting data, synthesizing it into dashboards, and sharing it with the many constituents, proactive and holistic risk management is an integral part of any change journey. Forward-thinking risk management in strategic transformations is needed, given the consequences of realized risks can be survival-threatening for the company. The Chief Transformation Officer must decide whether risk management processes are aligned with the transformation effort and its goals, or merely a “compliance” effort akin to auditing. Assessing the risk management processes should be conducted during the early stages of the transformation journey. There are two ways in which risk-management methodology can complement the leadership of a Chief Transformation Officer. Firstly, an efficient risk management methodology can act as a proactive early warning system for the surprises that inevitably are bound to happen during a large-scale transformation. A proactive approach includes, for example, sketching out the risks associated with each project phase by type on a timeline and consciously deciding whether to mitigate these risks by extra resource allocation, wider user acceptance testing, or longer buffer times. Secondly, risk management, as commonly understood, is a systemic safeguard to ensure that some elementary risk factors are not overlooked when planning and implementing key change activities. Project teams should be guided to properly assess and quantify the risks inherent in their plans (using realistic benchmarking) based on a pre-existing standard categorization. Setting up these mechanisms and guiding the process falls on the Chief Transformation Officer. When both approaches are used, risk management is both forward-looking and comprehensive, and the risk management outcome is insightful, generating the big-picture view on the various risks threatening the transformation. This type of visibility is valuable for the entire leadership team to assess the potential consequences of these risks and decide how to mitigate them or take corrective actions if some risks are realized. Change has become the new normal, and while it may feel stressful at times management teams should not be afraid of (continuous) transformations. By embracing the new paradigm both the management team’s and the organization's change capability can be reinforced systematically. Starting with smaller change programs and increasing the scope and speed as experience and competences grow, a company can turn market pressure to change into a capability that becomes a competitive advantage. Introducing the role of the Chief Transformation Officer into the leadership team can provide a new perspective, skills and much needed muscle to the effort. https://www.forbes.com/sites/gilpress/2017/01/20/6-predictions-for-the-203-billion-big-data-analytics-market/;Forbes (2017). Cited 31.8.2017. IDC (2013) Big Data Market to Hit $32 Billion in Four Years. Cited 20.12.2013.
https://www.forbes.com/sites/louiscolumbus/2017/01/29/internet-of-things-market-to-reach-267b-by-2020/#435bdf38609b; Forbes (2017) Internet Of Things Market To Reach $267B By 2020. Cited 31.8.2017.